If you want to unlock bootloader, install custom recovery, root your android device or flash a custom ROM on your device, you’re bound to encounter the terms such as ADB, ADB Drivers and Fastboot. In this guide we’ll talk about What is ADB and Fastboot? How to install ADB drivers and finally how to setup and use ADB and Fastboot for Android on your Windows and Mac OS X operating systems. ADB stands for Android Debug Bridge and it is a command-line utility included with Google’s Android SDK. ADB provides you terminal/command-line based interface to communicate/control your Linux based Android device over a USB connection from your computer. You can use ADB to run shell commands, transfer files back and forth, install and uninstall apps, reboot, reboot into recovery, reboot into bootloader and more. Using ADB, you can even backup and restore your Android phone/tablet. ADB comes as a part of the platform-tools in Android SDK (Software Development Kit). ADB allows developers to tinker with internal components of the Android OS that not not available to the user otherwise. Fastboot is a new term that has joined in the ADB. Fastboot is a special diagnostic and engineering protocol that you can boot your Android device into. While in fastboot mode, you can directly flash the file system, unsigned partition images in your Android device over a USB connections. Not all the Android phones/tablets have the Fastboot mode. Nexus device comes with fastboot by default as well as some other new devices from other brands. 1. 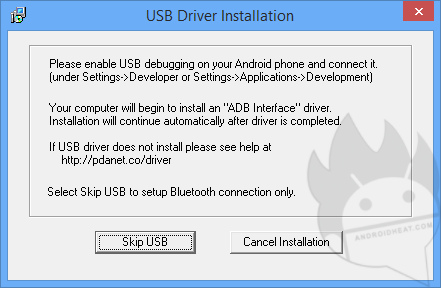 To install ADB drivers for your Android device, you need to download PdaNet. PdaNet comes with drivers from all major manufacturers, so it should take care of your drivers installation part. Here’s the download link: Download PdaNet. 2. Disconnect your device from your computer (do not connect until the process asks you to) and install PdaNet after downloading. Hit “Yes” if the installation process ask you to replace or uninstall existing drivers. 3. On phone selection screen, choose your device manufacturer, it it’s not listed or you’re not sure about it, select “Others”. 4. A scary warning in red will appear telling you that Windows couldn’t verify the publisher of the software. Just click on “Install this Driver Software anyway”. This warning may appear multiple times, keep clicking on install drivers anyway until it stops appearing. 5. When PdaNet will ask you to connect your device in USB debugging mode. Connect your Android device to your computer and let the drivers installation to complete. 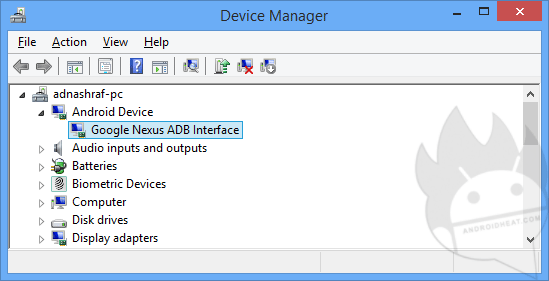 Once the drivers installation completes, it means you’ve successfully installed ADB drivers for your android device. 6. 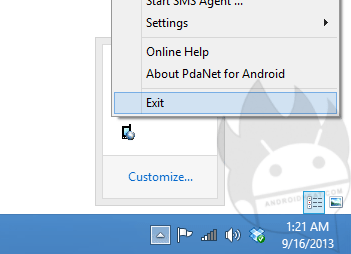 Make sure to exit PdaNet from the taskbar. This is just a precautionary measure because PdaNet, running in the background, may interfere with ADB/fastboot commands. 7. To confirm whether the ADB drivers are installed properly or not, connect your device to your computer, open “Device Manager” in Windows Computer and see if there’s any sign of exclamation (!) with any ADB/your device listing. If there’s none, you’re good to go. If you think drivers are not installed properly, you can use USBDeview to uninstall the drivers and then reinstall them using the above process again. 1. 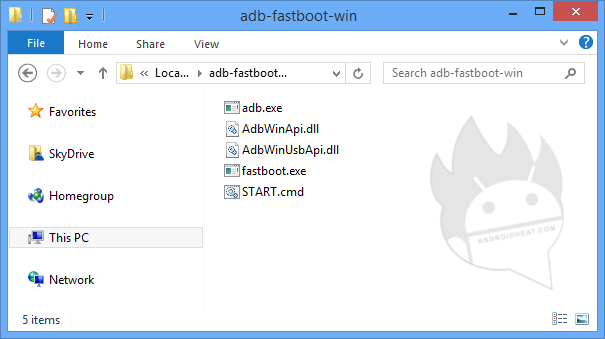 To setup ADB and fastboot for Android device in your Windows computer, first you need to download this .zip file: adb-fastboot-win.zip. It contains all the required files for ADB & fastboot (adb.exe, fastboot.exe, AdbWinApi.dll, AdbWinUsbApi.dll), Start.cmd file opens Command Prompt into ADB & fastboot directory. 2. Extract the downloaded adb-fastboot-win.zip file and put the extracted folder wherever convenient in your computer. This is it! 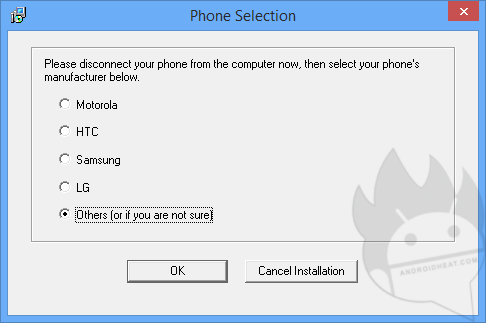 You have successfully set up ADB and fastboot for Android in Windows. Now whenever you want to use ADB or fastboot commands, simply run the START.cmd file. If if return the serial number, then you have set it up successfully and are good to go! Some useful ADB commands can be found at the bottom of this guide. 1. To setup ADB and fastboot on your Mac running OS X, first you need to download this .zip file: adb-fastboot-mac.zip. 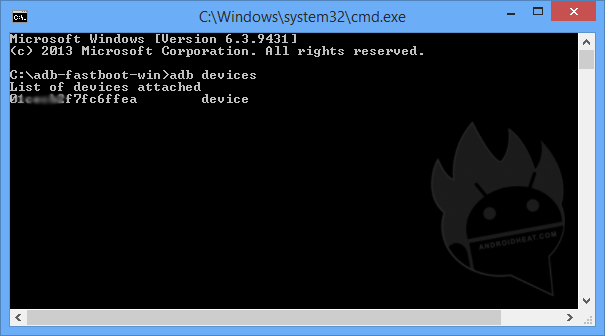 It contains all the required files for ADB & fastboot (adb.exe, fastboot.exe, AdbWinApi.dll, AdbWinUsbApi.dll). 2. Extract the downloaded adb-fastboot-mac.zip file and put the extracted folder wherever convenient in your Mac computer. While you can ADB and fastboot right away, but you’ll have to navigate the terminal to the folder containing ADB and fastboot files. we will make an entry in ~/.bash_profile configuration files to make ADB accessible from terminal from anywhere. Replace your_adb_dir with the path to the folder containing ADB files (Step 2) e.g. Users/abc/adb-fastboot-mac. 5. Save the files, press CTRL+X to exit, then Y to confirm the save then press enter. It will close the nano editor. That’s it! Now you should be able to use ADB and fastboot commands from anywhere in the Terminal. You can now close the Terminal. If it return the serial number, then you have set it up successfully and are good to go! Below you can find some useful commands for both ADB and fastboot. Note: to run all these commands, make sure USB debugging is enabled on your device. Note: to run all these commands, your android devices must be in fastboot mode. fastboot oem unlock – to unlock bootloader of Nexus devices. This entry was posted in How to on September 16, 2013 by Adnan Ashraf. How to go into recovery when phone not on (ROM installation gone wrong can’t go recovery thru buttons)? You’ve bricked it. That means you cannot even turn it on anymore and is essentially a “brick”. I tried installing adb flashboot directly it doesn’t installing only cmd runs(blank) and closes after 2 sec. So pdnet help to cover this prob. Or not?